Not my favorite movie of the month. While it has the potential to be a good flick, Danny Boyle (Slumdog Millionarie) just doesn’t hit the mark, in my opinion. A lot of people would think of this film sort of a tribute to the zombie-movie-master, George A. Romero (Night of the Living Dead, Day of the Dead, Dawn of the Dead, et. al. 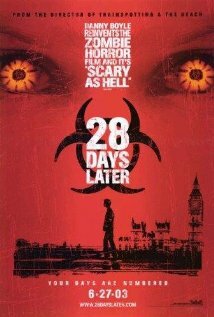 ), but without a good point of reference from a lot of movie watchers, 28 Days Later is more of a take off on The Crazies. Plot: Animal activists invade a laboratory with the intention of releasing chimpanzees that are undergoing experimentation, infected by a virus -a virus that causes rage. The naive activists ignore the pleas of a scientist to keep the cages locked, with disastrous results. Twenty-eight days later, our protagonist, Jim, wakes up from a coma, alone, in an abandoned hospital. He begins to seek out anyone else to find London is deserted, apparently without a living soul. After finding a church, which had become inhabited by zombie like humans intent on his demise, he runs for his life. Selena and Mark rescue him from the horde and bring him up to date on the mass carnage and horror as all of London tore itself apart. This is a tale of survival and ultimately, heroics, with nice subtext about mankind’s savage nature. What is your favorite scary movie? Leave us a comment. We would love to hear from you. Previous What happened between breakfast and lunch today?